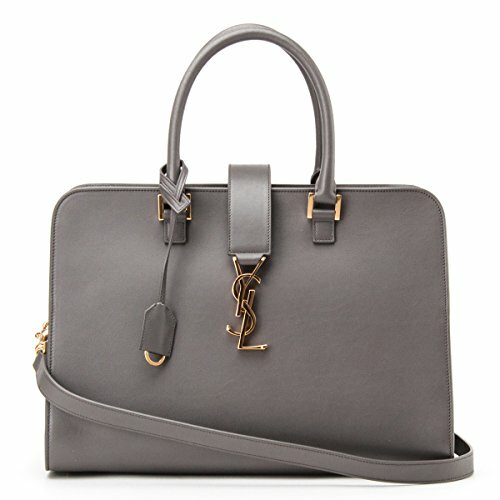 Saint Laurent Classic YSL Cabas Monogram Satchel Shoulder Bag 357395 in Grey Leather | Accessorising - Brand Name / Designer Handbags For Carry & Wear... Share If You Care! Saint Laurent Classic YSL Cabas Monogram Satchel Shoulder Bag 357395 in Grey Leather – Measures 14.5 length x 7 width x 10 height inches – Gold hardware with YSL monogram logo, gold-stamped SAINT LAURENT Paris, zip top closure – Interior pockets and zip pocket, removable leather shoulder strap – Authentic Saint Laurent, yves (YSL), made in Italy. Includes authenticity cards, controllato cards, and SAINT LAURENT dust-bag. Authentic Saint Laurent, yves (YSL), made in Italy. Includes authenticity cards, controllato cards, and SAINT LAURENT dust-bag.